The story of the Jewish holiday of Purim, as told in the Bible’s Book of Esther, tells of the deliverance of the Jewish people from an annihilation plot of the Persian king Haman. Like most Jewish holidays, this one has its traditional food, hamentashen (also spelled hamantashen), which means “Haman’s pockets” in Yiddish. Hamentashen is a triangular-shaped pastry with a cookie-like dough, not particularly sweet, originally filled with a sweetened poppy seed or prune paste. Today hamentashen is made with a variety of fillings to please modern palates. You can order a gift bucket of Exceptional Hamentashen from Claire Saueroff, award-winning baker of the Exceptional Brownie (read our review), in an assortment that includes Awesome Apricot, Puckered Prune, Rockin’ Raspberry and Poppy’s Poppy (Claire recognizes that some diets preclude poppy—it’s our favorite). There are also chocolate-dipped varieties. You’ll get approximately two dozen hamentashen to enjoy with a nice cup of tea (black tea, please—find some of our favorites in the Tea Section of THE NIBBLE online magazine). You can’t steal Ben Stein’s money, but you can take a bite out of Haman’s pockets (that’s what hamentashen means). The hamentashen are kosher, of course (OU Parve). But if you’re not kosher, not Jewish, and/or have never had a good piece of hamentashen (there are plenty of questionable pieces out there), here’s a good place to start. This year, Purim is celebrated on Friday, March 21; but you don’t have to wait until then to start nibbling on the hamentashen. 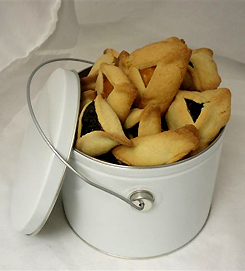 – Purchase Exceptional Hamentaschen at TheExceptionalBrownie.com. – A half gallon in a reusable white bucket, shown, is $45.00. Gift boxes are available from $25.00. – Read what what happened to King Haman and see him immortalized on the ceiling of the Sistine Chapel by Michelangelo. – Find more delicious kosher products in the Kosher Nibbles section of THE NIBBLE online magazine. Skip the green beer, have a green Grey Goose cocktail, the “Dublin Delight.” Don’t color the beer green at your St. Patrick’s Day party. Let the beer drinkers enjoy fine craft beer in the golden color it should be. Those who want a vodka cocktail can go green with a Dublin Delight from Grey Goose Vodka. It was specially created to abet drinkin ‘o the green by master mixologist, Nick Mautone, author of Raising the Bar (“Better Drinks, Better Entertaining”). Starting with Grey Goose Vodka’s popular Le Citron lemon-flavored vodka, the ingredients include kiwi, simple syrup, a sprig of mint, a small piece of vanilla pod and a splash of club soda. It’s not as simple as pouring tonic water into the gin, but once you make up a pitcher, it’s smooth sailing—and you have something memorable for your guests. – Read the full Dublin Delight recipe. – Find more seasonal cocktails in the Cocktails Section of THE NIBBLE online magazine. NIBBLE readers have the option to read our Top Pick Of The Week product review on TheNibble.com, or get it by email. It is emailed on Tuesday mornings at 8 a.m. By 8:37 a.m. on Tuesday, we got an email from this week’s Top Pick, Lisa’s Cookie Shop, saying that their “website was being hit like crazy” and they were “receiving a ton of online orders.” What does this mean? 1. People really like chocolate chip cookies, and Lisa’s other offering, bar cookies. 2. Photographer Claire Freierman did a very convincing job, making those cookies and bars look great on the page. 3. People are up really early reading their email, because the Top Pick has a national readership, and only about 25% live on the East Coast. 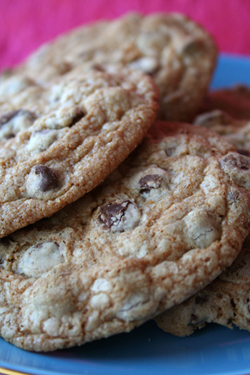 Lisa’s crunchy chocolate chip cookies. The crisp, crunchy, wonderful chocolate chip cookie group includes Chocolate Chip Coconut Chocolate Chip cookies and Kitchen Sink (with cranberries and macadamia nuts). You could make meal of these cookies and never feel ill, they seem so wholesome and nutritious. We know, as we’ve done it five or six times while “researching” the review. Just the fragrance of butter, chocolate and other fine ingredients leaping out of the bag might be satisfying enough for those who feel the need for restraint. The soft, chewy Pecan Bars and Raspberry Bars are equally magnificent. The Pecan Bar is like a pecan-coconut pie-in-a-bar. And THE NIBBLE staff flipped over the moist, tender Frazzleberry Cookies—shortbread thumbprint cookies, rolled in coconut with a big well of lush raspberry jam. Everything is baked to order, so read the full review and order yours. Find more of our Top Picks Of The Week in the Top Picks Archives on THE NIBBLE online magazine. Drink milk and rock with these guys. We love milk, we think it rocks. So do country rockers Rascal Flatts. Want to sing live on stage with them, in front of 30,000 screaming fans? Just go to MilkRocks.com to pick your favorite Rascal Flatts song, then upload a karaoke-style video of you (or your kids) singing it. The top 10 winners (decided by the Milk Rocks! community) will win signed Les Paul Gibson guitars plus CDs and posters signed by Rascal Flatts. 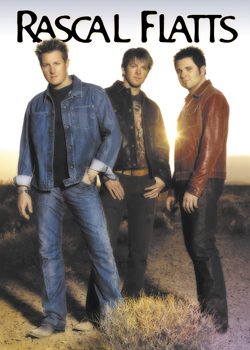 Rascal Flatts themselves will choose the winner from the top three entrants, on April 15th. Visit the Milk Rocks! website to hear the band speak about milk nutrition facts, also visible on more than 100 million milk cartons, 40,000 school lunch room posters and at Rascal Flatts concert venues. Chocolate lovers: New temptation has been put in your path. Starbucks has launched a new collection of artisan-style chocolates, developed with the Artisan Confections Company, a wholly owned subsidiary of The Hershey Company (the subsidiary includes Dagoba Chocolate, Joseph Schmidt Confections and Scharffen Berger Chocolate Maker). Master chocolatiers have created a portfolio of chocolates with flavors inspired by Starbucks coffees and Tazo teas. And, they are darned good. Made with high-quality cacao and other premium natural ingredients, the collection is artistic, flavorful…and extremely affordable. 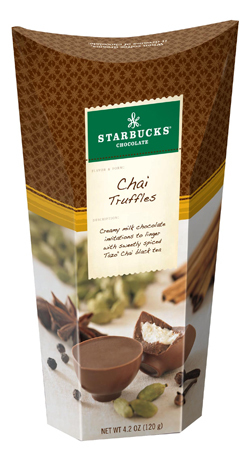 It includes Tazo Chai, Passion[fruit] and Citron tea-infused chocolate tasting squares; Caffè Mocha, Chai, Espresso, Caramel Macchiato and Madagascar Vanilla Bean Truffles; and Milk Chocolate Covered Caffè Verona Coffee Beans. For those who like their chocolate plain, there are dark, mocha and milk chocolate bars and tasting squares. The tea-infused tasting squares are dynamite—perfect with a cup of coffee or tea, or just a burst of fine chocolate. The Citron square is an epiphany, Passion is perfect, and the Chai is enchanting. The milk chocolate-covered coffee beans are among the best we’ve ever had, plump and robust (and let’s face it, if these two companies together can’t master a chocolate-covered coffee bean, who can?). And yes, the truffles are very good too. Look closely at the shape of these bonbons, filled with chai-flavored creme: They’re tea cups! But the best thing is the low price: The various bags and boxes retail for $2.99 to $5.99 (individual packages) at grocery, mass retailers, club and drug stores nationwide. Alas, the chocolates are not available in Starbucks stores at this time…but I suppose we’re lucky. It would be just too easy to get a bag of chocolate with that cappuccino. Every day. Read our full review of Starbucks Chocolates. – Read about more of our favorite chocolates in the Chocolate Section of THE NIBBLE online magazine. – Read our review of Dagoba Chocolate. – Read our review of Scharffen Berger Chocolate.